It's been already almost a month since I've returned from my last trip to Paris (I guess you are going to hear me talking quite often about this wonderful city, I simply adore it!! ); this time the trip was for professional reasons. A friend of mine and I went for the Molecular Gastronomy course held by Prof. Hervè This at the AgroParisTech but here I will concentrate on the fun side of the trip: the meals!!!. After a nice long walk of roughly 4 hours, we were ready to taste some good Parisian food. While walking through the Quartier Latin admiring the showcases of the antiques shops, we remembered having spotted a very nice Vietnamese restaurant in the same neighbourhood during our last trip (the Parisian White Night of 2008; a great night!). It took us a while to find it again but once there, we realized how impossible it was to miss it. It is the the “Pho 67” just behind the nice small church of St Julien le Pauvre overlooking Notre Dame. Looking at the showcases, what first grabbed our attention were the copies of the articles appearing in different travel guides suggesting this restaurant. The tiny room looked overcrowded from the outside but we forgot about the underground section. The place is tiny of dark colours; after the entrance, a small rise floor hosts half of the tables all packed together. Through a staircase you reach the second floor. Despite the fact that it could seem bigger at first sight, diners have to share it with some storage fridges and the kitchen. It couldn’t get more authentic! The menu features many simple traditional foods. We chose a seaweed soup, a tamarind-fish soup and a sauté dish with fresh vegetables, wheat noodles, minced meat and the irreplaceable fresh coriander. The soups were served in a high metal bowl that could accommodate some candles below to keep the soup hot (boiling hot actually, we had to extinguish most of them to continue eating :PP). The dishes were abundant and of clean taste. The soups were particularly fulfilling. The fresh aromatic taste of tamarind was infused in the broth as well as above it. The fish was most probably a carp and its hearty taste was quite complementary to the lemony taste of the broth and the fresh coriander was a perfect link. The seaweed soup had a very appealing hearty-smoky taste, a combined result of the crunchy seaweeds and the prawns. With our bellies full and spirits lifted up, we walked back home enjoying the showcases of African antiques shops on the way, the people queuing at the close-by cinema and the fresh air oh a January night in Paris. On Saturday we decided to take a walk to the Tour Montparnasse to have a coffee at the bar at the last floor of the tower: “Le Ciel de Paris”. The view was breathtaking! The whole north section of the city's famous Parisian roofs was just in front of us, behind the glass walls. The day was gray and misty with light drizzle every now and then, but while sipping our drinks blades of sun light found their way through the clouds. 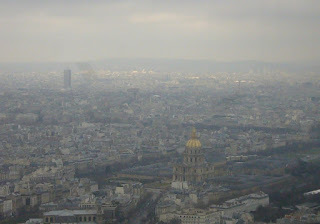 The golden dome of les Invalides at our right started sparkling at the sunlight; the thinning of the mist let the shy church of Montmartre appear. 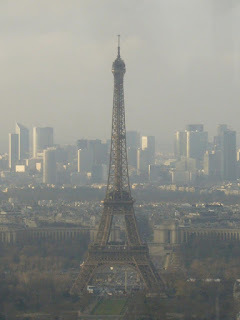 In the distance, the vast island of glass and metal trees and the skyscrapers of la Défense were finding fine company to the silhouette of the Tour Eiffel. After some shopping, it was time to have dinner. We decided to have cheese fondue in a restaurant near our apartment in the Mouffetard. We chose the “Piano Muet”. It was full so we waited few minutes outside, which was quite a pleasure actually since the weather was mild and the street was full of students enjoying the weekend (most of them were queuing in front of the Greek take-away “Au Petit Grecque”). After 5minutes we got our table. The restaurant was quite small and full. Once seated at our table in the corner of the second room, we ordered a mix of cold cuts as entrée, cheese fondue and Tartiflette as main dishes and chocolate fondue as dessert. While waiting for our meal, we had time to chitchat and enjoy the rustic atmosphere of the place, recalling the wooden chalets of the French Alps. The cheese fondue came in a blue pot that the waitress put over the gas stove. The Tartiflette, came into a single ramekin. Speciality of the French region of Savoy, this great savoury dish is made with slices of boiled potatoes roasted in a pan with smoked bacon and onions that is finished in the oven after having topped them with half a form of Reblochon cheese, Yum!! More chatting, some nice red wine, the food was gone in a minute! Everything was very tasty, as we had hoped. The atmosphere was very relaxed and we enjoyed it all until the last bit of our dinner. What did we do on Sunday??? 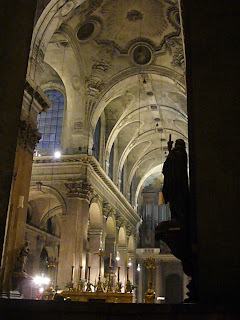 Ah yes… we went down to St. Sulpice. It was quite long time since our last visit to the cathedral. I was quite surprised by the fact that they were hosting an exhibition featuring a manger in ceramic from Caltagirone, a small city in Sicily I know (otherwise why the surprise?) quite famous for its ceramic productions. The great frescos of Delacroix welcomed us at the beginning of the right aisle. I didn’t remember his colour palette; so fresh! The atmosphere was very calm and there was no service on. Walking all along the aisles surrounding the service area, we noticed the many chapels with their hidden doors and Empire style decorations. 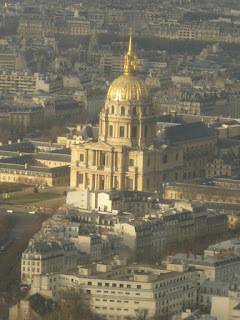 At the transept, the diagonal golden cut of the gnomon reminded us of the symbolic importance of this building. Gazing at the nearby stained-glass window, we could spot the lens that allowed the priests of the past to determine the right location of the Catholic Easter Sunday. Continuing on our walk, we were attracted by the stele erected at the meridian; a part of it seemed to have been erased in the past… curiously enough, this was part of a citation from the Holy Scriptures. The afternoon continued with a visit to the nearby by library and the China-House, where we received quite a rude "welcome" by the girl at the tea room (we were there around 18:30, when the closing time is 19h. Enough time for a tea.). We opted for a coffee in a stylish pub not too far from there. Walking along the busy streets we decided we were in the mood for couscous. We needed to find a place…. Strolling along the 6th arrondissement, we passed by a restaurant called “La Soummam” that we chose as our dining place, and on our way we spotted another restaurant that we decided to try the next day! The restaurant turned out to have a pleasing Algerian “cut”. The room was big and quite warmly decorated. The black and white pictures on the wall reflected moments of everyday life of Algerian housewives. Some postcards yellowed by time, adding a few more touches of colours to the walls near the wardrobe. Seated at a table along the glass wall facing the street, we looked at the simple menu, trying to negotiate with each other what to choose. At the end, we decided to have a salad and spicy lamb sausages (merguez) as appetizer, couscous Royale and lamb tajine as main dishes, all nicely wetted by a fresh aromatic red wine from Morocco: Boulaouane. Everything was hefty and very tasty! The couscous came with chick-peas, vegetables in tomato broth, and mixed grilled meat (chicken thigh, veal-steak sticks, lamb and merguez). Stuffed as never before, we faced our way back home. After some relaxing reading with oldies music diffused by French radio, Morfeo welcomed us into his arms. Time to start working! Waked up early, we had a nice breakfast with some toasted dark-bread dipped in spicy bio-olive oil, white yoghurt and some fruit. We then headed toward the AgroParisTech for our Molecular Gastronomy course. Ready at around 18h, we reached home to leave our heavy backpacks and then ready to hit the city for dinner! We took a new way down town that brought us near the Arabic Institute. We knew were we wanted to go but we got somehow lost. :P Eventually we found it: “Atelier Maitre Albert”. Quite close to the Seine this restaurant turned out to be one of the best we had in our trip. Warmly welcomed, we left our coats with the maitre that stored them in the wardrobe. Trough the small entrance space we could gaze at the long luminous room at our right: the wine bar. The long counter faced a wall covered in wine bottles while in front of it, a few tables were waiting for hungry customers. At our right instead, a big square room hosted a dining table around which a group of friends was enjoying dinner. Following the maitre, we entered the dining room. The big limestone fireplace immediately attracted our attention. Many tables were set. The predominant colour was anthracite gray. The long front wall was decorated with three pop-art paintings with colourful writings. The tabletops, of dark polished marble, were spotted by the bright orange of the paper tablecloth holding the signs of the restaurant: a fish and a chicken (the restaurant was actually a rotisserie). We chose as main dish Scorpion fish« à la plancha», juice with herbs, artichoke gratin and Spit-Roasted free-range chicken with mashed potatoes. The very fine white porcelain plates came holding the food in a light and essential presentation. The roasted half chicken breast and its drumstick with their crunchy skin, were presented over a runny dark jus with the potatoes purée. Aside came a nice small oval cast-iron pan holding some more potatoes purée. The chicken was nice and pinkish inside, soft and infused with the flavours of the roasted skin. It tastes perfectly complemented by the buttery home-made potatoes purée. The fish fillet instead came over its sauce with the artichokes gratin presented aside in a small round cast-iron pan. I got to taste a small bite of the whole dish and I was quite impressed by the freshness and crunchiness of the artichokes gratin. The thinned sliced artichokes hearts were lukewarm and perfectly complemented by some extra-virgin olive oil. As dessert we decided to go fruit. We took a grapefruit terrine with tea sauce and some Comté cheese with green apple salad. Will be too simplistic to say that we got smashed by the elegant porcelain on which the desserts were served. The grapefruit terrine came into a trapezoidal dish with the two parallel sides slightly bend up. The Comté and apple salad instead came in a flower shaped dish of a smooth design, like a child would do. The cheese, cut in long strips, was arranged along the rim while the apple salad was set in the centre. The cheese was creamy and of smooth character. The apples were crunchy and fragrant. Nice couple indeed! The terrine came literally apart while in your mouth. The skinless wedges of pink grapefruit were fresh and crunchy. The light orange flavoured gelatin holding them together served perfectly in accenting their slight bitter flavour. The morning was kept busy with the second day of our course. The day went smooth, despite the fact that I risked to lose my wallet (it fell under the chair in the auditorium). For lunch we went to a charming small place directly on rue Mouffetard specialized in quiches: the “Mouff’Tarte”. That’s definitely a place you want to be if you like quiches (tartes). The place is quite small; the light green and blue walls create a very fresh atmosphere. The kindness of the owners makes it a perfect place to relax for lunch time. The offer of freshly baked tartes is amazing! Roquefort and potatoes, eggplant and minced meat, tarte Savoyarde; not forgetting the sweet tartes: Pears and frangipane, chocolate cream, chocolate and nuts etc. After the course was finished, we decided to try a nice tearoom we spotted close to our apartment. “Caramelle” was its name. Classical music was playing. The second floor with his wooden balcony toward the first one made the atmosphere a bit country but still very fresh. The guy running the place was also making a set of preserves sold into jars that the customers kindly bring him. For dinner, we met a friend of mine and went in a small Vietnamese restaurant in Belleville. Honestly, nothing to compare with the “Pho 67” but the company made it all. After dinner we decided to have a drink in the new hotel designed by Philippe Stark in the now trendy 20th arrondissement: the “Mama Shelter”. Just in front of the smashing “La Flèche d’Or”, the hotel is built on the side of an unused railway. The bar-restaurant occupies a very big and long ambient all played over the dark tones of black and gray. The wine bar at the entrance, had huge screens making up the counter (that night the glorious presidential parade of the newly elected president Obama, was in every screen). A curtain decorated with black and white faces of people was hiding the balconies giving toward the railway (preferred spot of the smokers). The restaurant room was very big. The open kitchen standing at the far end wall, the all-round bar counter just in the middle, were giving rhythm to the room. The table-football station and the wooden chairs surrounding the big group tables at the far right side of the room, made the atmosphere very fresh and playful. While sipping our cocktails, we could gaze over the TV-screens hosted into 2 pillars at the sides of the bar counter but, most of all, at the ceiling. Yes exactly, the ceiling! It was pretty low, perhaps 2m something, black in colour with writings all over. 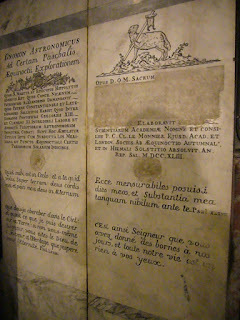 Citations of famous poets and way of saying were in fact written with colourful chalks over it in a sort of anti-gravity graffiti. Once finished our drinks, it was time to go back to our apartment… Our suitcases were awaiting us. The next day we were heading toward Bonn, again…. (not before the usual raid at the newspapers shop at the Gare du Nord:P).